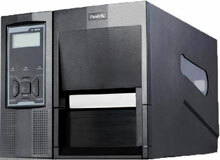 Postek TX3 - 300 dpi Industrial Thermal transfer and Direct thermal printing, 8 ips, 4 MB FLASH ROM, 8 MB SDRAM, 32-bit embedded ARM CPU, Reflective and Transmissive media sensors (both adjustable), RS-232 Serial, USB, Parallel, and PS/2, 8" media roll, 5 function buttons, 2 line graphical LCD. Comes standard with robust label design software in the box. Precision Built, Sturdy and Durable. The Postek TX3 Industrial printer is a true industrial grade printer, featuring innovative state of the art technology and superior quality workmanship. Their all metal frame and unique core construction form a sturdy and durable stationary printer platform. The two line graphic LCD provides constant monitoring of all print jobs. Buttons on the panel achieve one touch Media Calibration, one touch entering Setup menu in TX3. A powerful control system can easily handle the most complicated printing requirements, at high-speed printing. Advanced Thermal transfer technology offers optimum printout clarity.